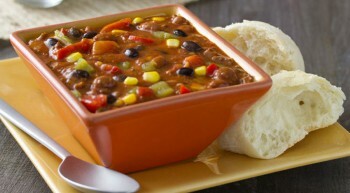 Vanee Chili with Beans is a traditional ground beef chili with tender whole beans and is served in a flavorful tomato sauce. 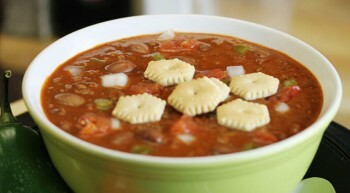 Great on chili dogs, fries, baked potatoes, nachos, or as a base for your own signature chili. Comes conveniently packed in 6 #10 cans. 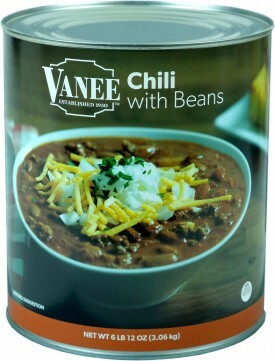 Vanee Chili with Beans frees up valuable freezer space by being shelf-stable, has lower sodium than the national brands, and is heat and serve for ultimate back-of-house simplicity. Each 108 oz. can has 12 one-cup servings, for 72 total servings in a case. 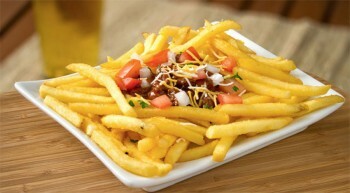 Serve 8 oz. 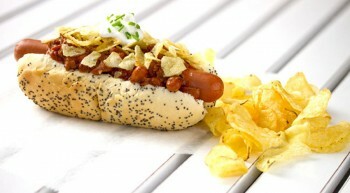 in bread bowl, or use as topping for chili dogs, baked potatoes, omelets, nachos, or French fries.